12 oz bottle, marked 3LQ, served in lager glass. Looks great: deep red-amber (light copper) body with a large semi-creamy, light tan head that leaves plenty of lacing and has very good retention. High clarity with fine-grained carbonation bubbling. Aroma: surprisingly sharp and strong hop note, considering the style. Sweet caramel with a hint of maple. Flavor: odd sweet-bitter balance that seems to swing back and forth from bitter to sweet but is overall mildly bitter. Decent malt complexity. Unfortunately, only a faint hint of maple syrup. Feel: Medium-full with excellent, soft carbonation. Very creamy for style. This pours a lovely red with a 2 finger head of foam. It smells balanced. Nice hoppy aromas with ample malt backing it up. Taste wise, it's not as balanced as the smell as the bitter hops are very assertive. I do have to say the malt is well done and I do get hints of maple. This is a solid brew for the autumn season and it's very easy to drink. Appearance: Pours a very pretty, opaque, deep, dark, amber/mahogany color, speckled with reddish highlights and two and a half fingers of white-colored head that quickly dissolved away into a thin lacing of foam that completely covered the top of the beer. As the beer is consumed, there’s some gorgeous lacing of foam that clings to the sides of the glass. Aroma: Very aromatic, with notes of bready, toasted malt, imparting aromas of freshly baked French Baguettes and English muffins, followed by some maple syrup and caramel, as well as some piney, grassy, hops. Taste: Very nice! Lots of the bready, toasted malt up front, imparting biscuit-like flavors, followed by caramel, honey and maple syrup-like sweetness, a touch of lemony citrus, and some spices of black pepper and a touch of clove. The beer finishes with some beautifully balanced, grassy, piney, ever-so-slightly bitter hops. Delicious! Mouthfeel: Medium bodied and nicely effervescent as there is quite a bit of carbonation in this beer. With an ABV of 6.0%, there is no alcohol on the palate. Overall: This is another damn good beer from Anchor Brewing. Malty, slightly sweet and balanced beautifully with some piney, slightly bitter hops, this beer is an excellent beer for the autumn season, and a unique one too, as it’s not a pumpkin beer or an Oktoberfest beer, which are the typical beers for this time of year. Delicious! 12oz brown bottle with a freshness code. Amber hue, slightly hazed with a tiny bubbled sudsy lacing that sticks around for a while. Soft resiny hops, hint of maple, toasted bread, light stone fruit, and some earthiness in the nose. Smooth, toasted maltiness, orangey hops, hint of maple, mild peppery hop bitterness, bread crust, semi-dry finish with toasted grain, hop resin and faint maple in the end. 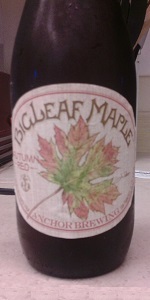 A fine fall time brew here, well balanced and easy to drink. Could certainly go for more than one. Picked this up at Gary's in Wayne last week, excited to see another seasonal offering to go with the Bock, Summer, and Special Ales that I buy nearly every year. While this wasn't a bad beer, this didn't quite measure up to those and like so many others on here, I could not taste the maple in this. I was even more surprised when I logged on here to see that this was categorized as an American Amber/Red Ale, given the lack of a hop profile and balance of this beer. Without a doubt, the pour was the best aspect to be enjoyed here. The deep apricot hue, almost-clear opacity, fluffy head, and solid rings of lacing combined for a pleasing appearance that held its own from start to finish. Then came the aroma: resin, wood, and metal. Surely, this was a Pale ale...but it wasn't. It tasted like a fall beer as the natural notes kicked in more once I sipped this and the aftertaste was like that of copper. Where was the maple, the stickiness, the bite? Not at all present as the body to this was weak and not like a Brown Ale at all either. The carbonation wasn't strong enough to take away the harshness of this and there wasn't any sweetness to be found either. Thankfully, the booze wasn't too strong either, or else this would have scored lower in my book. I thought this beer was fine on its own but just didn't live up to the expectations based on its description or the reputation of Anchor's other offerings. As a seasonal, this wouldn't be a great first choice and is only worth a go for those who want to give all the Anchor beers a try. I hope that next year's is a bit more on the mark and worth picking up in the midst of a ton of other Autumn offerings. Pours a one finger bubbly head with lots of lacing. Beautiful golden amber body color, really does remind me of autumn. Not sure what I was really expecting here. Aroma seems to consist of citrus, grassy and hoppy notes. Slight graininess to it. Can't pick up any maple syrup or malty notes. Pretty bitter, not very balanced. Slight caramel malt in the background. Dominant citrus, tropical, and grassy notes on the tongue. Bit of graininess flavor to it. Can't pick up any maple syrup. Nice carbonation and decent body feel to it. I dunno, just like some other users here I can't seem to pick up any maple syrup. What I do get though is lots of citrus and grassy hop flavors. Pretty bitter and unbalanced, small malty presence. 12 oz. bottle, with bottling code 4GV on the back label. Another new one to me from Anchor Brewing Co., acquired a single bottle of this stuff as part of a mixed six pack at the local Binny's. "Red ale brewed with maple syrup". Sounds nice enough. Overall, an interesting beer, but not entirely what I was expecting. Anchor is usually pretty hit or miss for me, and this one didn't really do it. Not bad by any means, I would be willing to have it again, I just don't know how well it works as a maple syrup infused red ale.